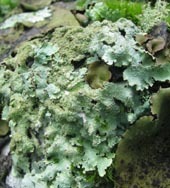 Most of these photos were contributed by fellow hiker and amateur naturalist Dimitri Tundra. Speckled Grayshield (Punctelia rudecta): Note the sand-like speckles. Trunks and branches of trees. Photo by Dimitri Tundra. 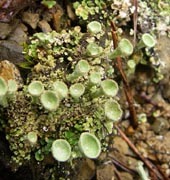 Baltimore Greenshield (Flavoparmelia baltimorensis): Similar to Common Greenshield except this species grows on rocks while the other is found on the trunk of trees. Photo by Dimitri Tundra. 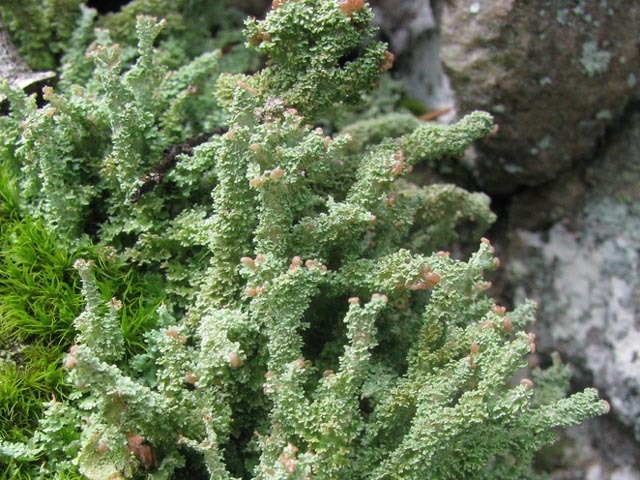 Allocetraria oakesiana: This species is commonly found on the bark of hardwoods and conifers and on rocks in northern woods. Photo by Dimitri Tundra. Goblet Lichen (Cladonia fimbriata): There are several similar species found growing on rocks with other lichens and mosses. Photo by Dimitri Tundra. 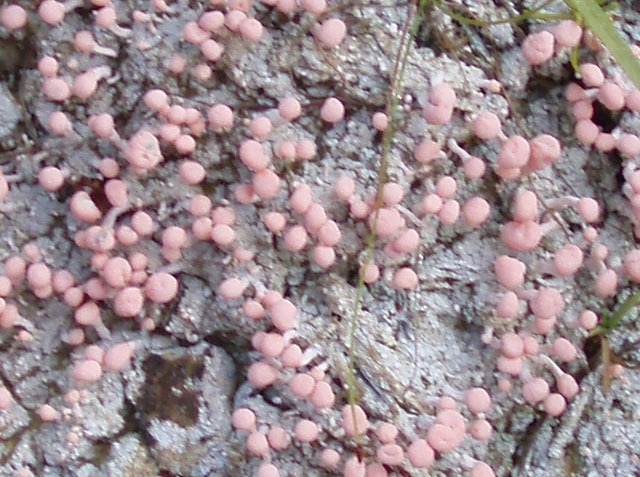 Pink Earth (Dibaeis baeomyces): This tiny pioneer lichen can colonize large patches of bare ground. Location: Roaring Plains, MNF, WV. 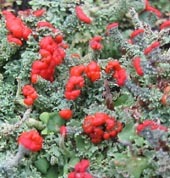 Beaumont's Cup Lichen (Cladonia beaumontii): Found on the bark of trees. Photo by Dimitri Tundra. 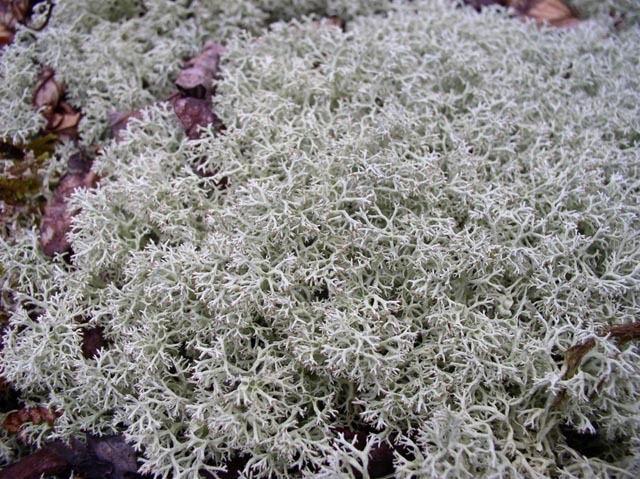 Cladonia Spp: There are many species of Reindeer Lichens some of which are difficult to tell apart by the casual observer with nothing more than a photograph to go by. 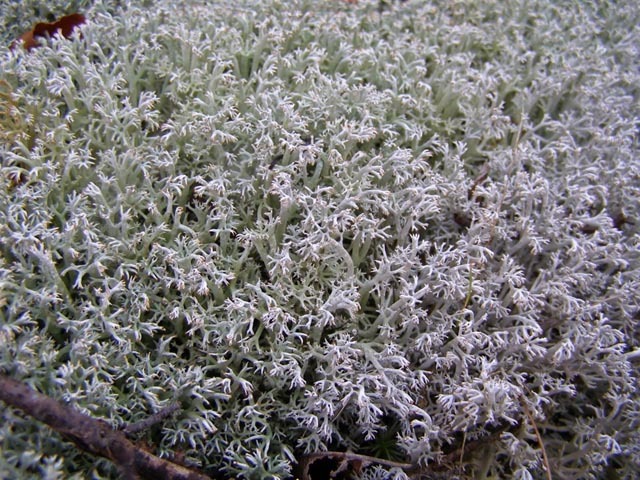 Most grow on the ground in large patches. Some forms are commonly harvested, died different colors and broken up to me used as "miniature shrubs" in Christmas gardens and similar displays. Photo by Dimitri Tundra. 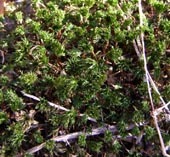 Sphagnum Peat Moss: There are between 151 and 350 species of Sphagnum ranging in color from yellow to red (the latter usually during its reproductive phase). 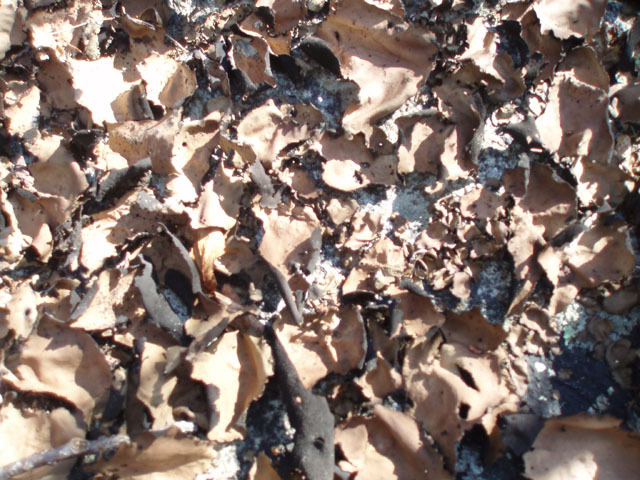 It requires a specialist to identify individual species. Photo by Dimitri Tundra. 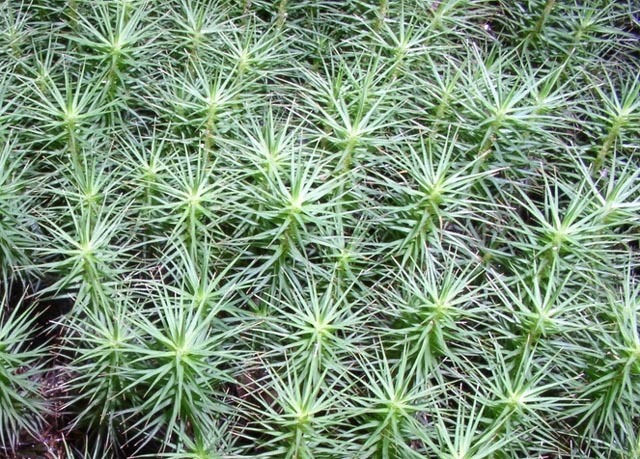 Haircap Moss (Polytrichum juniperinum): Forms dense mats in disturbed areas and the edge of bogs. photo by Dimitri Tundra.